Global economy is driving manufacturing companies into a paradigm revolution. Highly customizable products at lower prices and with higher quality are among the most imposed influence factors. To respond properly to these external and internal constraints, such as work absence and machine failures, companies must be in a constant adaptation phase. Several manufacturing control architectures have been proposed throughout the years displaying more or less success to adapt into different manufacturing situations. These architectures follow different design paradigms but recently the decentralization and distribution of the processing power into a set of cooperating and collaborative entities is becoming the trend. Despite of the effort spent, there is still the need to empower those architectures with evolutionary capabilities and self-organization mechanisms to enable the constant adaption to disturbances. 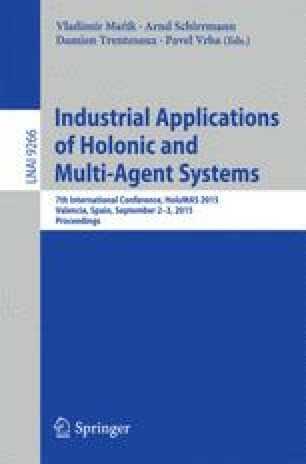 This paper presents a behavioural mechanism embed in the ADACOR2 holons. A validation procedure for this mechanism is also presented and results extracted. This validation is achieved through the use of a benchmark and results are compared with classical hierarchical and heterarchical architectures as also with the ADACOR.